“…The government is essentially declaring that coercion is morally equivalent to trade; that, in terms of ethics, thinking, working and producing an income in order to live and pursue ones own happiness is a vice, whereas it is a virtue to have a government steal money for you, from the pockets of those who earn it; a vice to take by force if you wear a fedora, a virtue to do so if you wear a crown. But, in truth, had a Tony Soprano done this for Linamar, our moral evaluation of the government could not rationally be any different…” Click here to read the full media release. 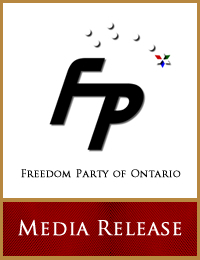 “…For decades, Ontario’s Progressive Conservative, Liberal, and NDP governments have told us that if not everybody can swim, the government must tie everyone to the deck of the HMCS OHIP and force everyone to sink along with her. Mass suffering and murder, they have told us routinely, are morally superior to the survival and happiness of some…” Click here to read the full media release.